2D When Pocket Stars starts up, it displays an overhead view of the sky. This is called the "2D Star Chart" mode. 3D Select "3D Orrery" mode from the menu to view the entire solar system and background stars and constellations from any point in the solar system. If you right click with the mouse on the star chart, a menu is displayed showing frequently used options which affect the chart presentation. The Info Page shows additional information about the selected body. 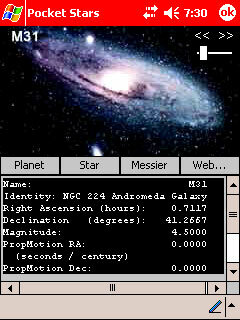 Tap-n-hold on the main star chart to display the Info page.